Cool, hip packaging and all. Pretty cool Trader Joe’s. So, cold brew coffee is this newish thing where coffee beans are ground up, steeped in water, etc, except no heat is ever used. Basically, you just leave a bunch of coffee grounds in water for 12 hours or so, filter it, then pour into a bottle. What results is a very cool sounding adjective phrase (COLD BREWED!) and a sort of vague curiosity as to why you’d want to bother. Didn’t they have any hot water around? Did someone forget to plug in the coffee maker? There are, in fact, a number of differences between cold and hot brewed coffee. Two big ones – the first obvious, the second a bit more subtle. The first and most notable thing is that it’s actually a coffee concentrate. The long brewing time infuses the water to about triple the ordinary strength. That means when you look at the 32 oz bottle Trader Joes’ is peddling, you should imagine a giant 96 oz jug in it’s place – that’s three quarters a gallon of straight java. The other point of difference has to do with relative acidity. Cold brewing coffee results in a much milder, low-acid version of hot brewed coffee. This makes for a much smoother drink and a cleaner, lighter taste. Although a certain level of cultivated acidity is sought out by some in their coffee blends, it’s in part this very acidity that makes coffee tough of stomachs, harsh on tongues and a bane to tooth enamel. If you have much experience as a coffee drinker, the difference here is immediately noticeable – the cold brewed coffee feels much more pleasant and drinkable. As a fellow who has no truck with acidic coffees, TJ’s cold brew is a welcome relief in this department. Beyond these two interesting characteristics, cold brewed coffee is basically just the same as hot coffee. Pour some in your morning mug, mix it with water/milk/etc and drink. Don’t get me wrong, the drink is fun and interesting – mixing it up feels like rogue chemistry and the cup is smooth and mellow – but it’s still basically just regular, arabica bean coffee. The question you’re going to have to ask yourself is, do you need a novel form of coffee in your life? Coffee is a workhorse, coffee gets the job done. It’s your morning slap in the face. It’s appreciated as a refined beverage by the few. Those folks, the collectors of brewing apparatuses, their larders stocked with whole beans, may appreciate this the way a beer enthusiast mulls over the differences between lagers and ales. The rest of us? Perhaps less so. This is a point that is thrown into high relief by one final point of difference – Trader Joe’s Cold Brew Coffee has a recommend shelf-life of 30 days once the seal is cracked. That means if you plan on drinking three quarts of coffee in the next month, but you don’t have a better way to brew it and/or you collect ways to brew it, this is your drink. To all others, this doesn’t have much to offer you beyond the momentary elation of novelty. Would I Recommend It (revised): Yes, to coffee drinkers and non-coffee drinkers alike. Would I Buy It Again: That’s more coffee than I need in a one month period, so no. Final Synopsis: Very low acid, but otherwise ordinary, coffee. This has never happened before, but guys I need to change my opinion on this product. It’s been three weeks since I first started drinking Trader Joe’s Cold Brew Coffee, and I have to say I’m learning to love it. Every morning these last few weeks I’ve been presented with two options: the hot pot of bubbling coffee on the burner or the cool jug of cold brew in the fridge. Every morning I’ve gone for the cold brew. I touch on the reason for this in my original post, but I feel the need to highlight it again here. This coffee really is very, very smooth. The acidity is so low, the taste so mild, that even my Joe Lunchpail, coffee-ignorant palette greatly prefers it. 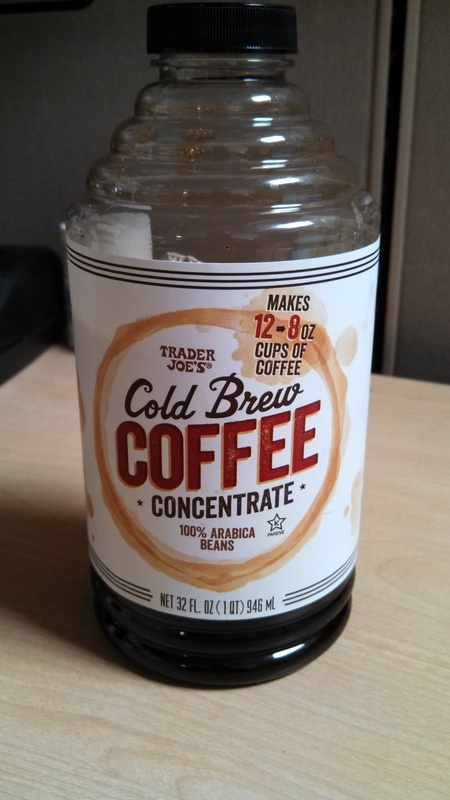 Trader Joe’s goes so far as to call their cold brew concentrate “sweet”. That would be stretching the common definition of the word – but in so far as air or fresh water can be sweet, it applies. If you’ve always found coffee too harsh to enjoy, trying this concentrate my completely turn you around.